The Orlando Magic have reportedly offered Florida coach Billy Donovan their head coaching spot with a salary attachment of $6M per year. Team officials (for the Magic) have told the Orlando Sentinel that Donovan is expected to take the job. As of May 25th, Donovan had not yet signed his new contract at Florida. If Donovan bounces for the NBA, that's one less heavyweight coach in a pretty crowded SEC. Personally I wouldn't be sorry to see him leave. 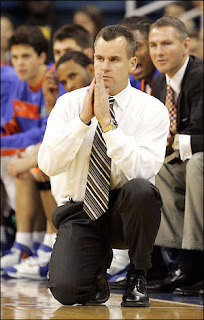 "Florida basketball coach Billy Donovan is a 'lock' to become new coach of the Orlando Magic, a source close to the situation tells CBS SportsLine.com's Gary Parrish"
GOODBYE GATORS AND GOOD RIDDANCE!!!!!!!! This is not at all surprising. The fact that he never signed a deal, despite agreeing to one in principal (thank you Billy Gillespie), had to raise red flags. This is great for Vanderbilt (and the rest of the SEC). Here's the question, who do we think is the front-runner for the UF job? My money is on VCU coach Anthony Grant. My nomination? Clearly Dana Altman..but don't worry, he'll run back to Creighton. Grant is a shoe in for the UF job. They love him down there, he knows the system, and proved he can win as a head coach. This is great news for Mason as well. I also wouldn't be shocked if UF made a a run at Bill Self. As was bantered about back when Coach Stallings was leaving Vanderbilt every other day back in April, Bill Self and the AD at Kansas don't get long. For Self, Florida would be an ideal place to land: there is less pressure to win, and despite having equally awesome resources vis-a-vie facilities and recruiting, Gainesville is a football first town. I hope its Self because he is a great recruiter who can't coach a lick. Kansas blows up all the time. For the talent they had they should get further in the tournament. Despite Masonfan's being a complete turncoat, I believe s/he is correct - AG is the best bet for the least amount of drop-off. Give him a couple years and he'll be recruiting as well or better than Self. After all, he learned from one of the best (I'll leave it to O'Shea's discretion to tell inside stories about Billy's recruiting exploits). Pat Forde agrees with you boys about Grant.